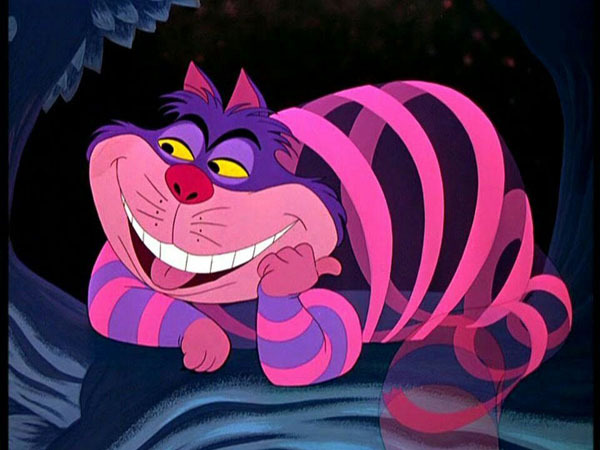 The issue of “Billboard” for March 31st, 1951, saw RCA Victor–one of the big boys in the record business–get on the Alice In Wonderland bandwagon — in a big, big way. The company issued four consecutively-numbered discs with at least one side of each being from the upcoming Disney animated feature. On 20/47-4087 (available on both 78 and 45 speeds), Hugo Winerhalter’s picked group of studio players played the theme from the film. Stuart Foster–an ex-Tommy Dorsey employee — took the vocal on this disc. Winerhalter, a big-band veteran, had cone to RCA in 1950, and was proving his worth, both as an accompanist for such singes as Eddie Fisher, and in his own records, as well. The next release, 20/47-4088, featured two lively numbers – “I’m Late” and “‘Twas Brillig”–as sung by Mindy Carson. Ironically, Carson–a singer regarded as being colorless–was the wife of Eddie Joy–who was the “Joy” of the Santly-Joy publishing house—that had handled Disney songs in the later 1940’s, before the establishment of Walt Disney Music, Inc.
20/47-4089 featured the ballad “All In The Golden Afternoon”, sung by a Chicago-based singer who had been featured on radio, and who was making a name for herself on television. Fran Allison had been appearing on “Don McNeill’s Breakfast Club” over ABC radio, both as a singer and as “Aunt Franny”. But she would earn more lasting fame interacting with Burr Tillstrom’s puppets on Kukla, Fran and Ollie. And, finally, 20/47-4090 featured “March of the Cards”, as played by the Three Suns, a cocktail-combo that was quite popular in the day. This group had been kicking about for ten or more years, consisting of Al Nevina (accordion), Morty Nevins (electric guitar) and Artie Dunn (Hammond organ and occasional vocals). The group had recorded before for Varsity, Decca, Hit and Majestic before going to RCA in 1947. At RCA, they would be augmented with other instruments or other singes, as the occasion demanded. Al Nevins would later partner with a young Don Kirshner, and their Aldon Music house set up in New York’s Brill Building (1619 Broadway), where they became involved in producing many popular records during the 1958-64 period. 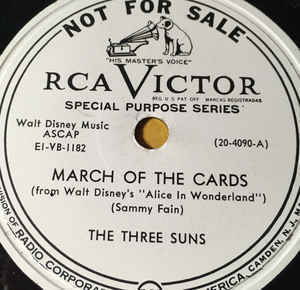 The disc of “March of the Cards” might have sold quite decently–especially as it was coupled with the Leroy Anderson’s current instrumental hit “The Syncopated Clock:”. RCA would dip into the “Alice” well again more than a month later. The May 5, 1951 issue had an advertisement for 20/47-4155, on which Ralph Flanagan’s big band would play “Very Good Advice”. Peggy King–who would hve a moderately-successful career in nightclubs and on television (especially on George Gobel’s shows of 1954-56) took the vocal refrain. And, of course, RCA would have a very good seller in the children’s field, when they released a “storyteller” set on Alice in Wonderland, with Kathryn Beaumont (from the film) well and truly featured. This would prove to be a good seller on the “Best-Selling Children’s Records” chart in “Billboard”. Greg Ehrbar has more here. NEXT WEEK: Greg Ehrbar returns!